Eight months before our wedding, the South of France was picked. The honeymoon was for the last week of July and first week of August; and the location had the perfect mix of great weather, fascinating culture and delicious food. The trip offered a great opportunity to go "off the beaten track," with hidden gems around each corner. 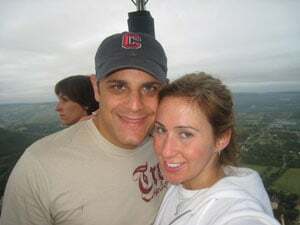 Our honeymoon started as a blank canvas waiting to be painted with fun, thrills and romance. To get ideas of where to stay, we recorded every relevant show on cable TV. Between Rick Steves, Rudy Maxa, Rachael Ray and Samantha Brown, our itinerary was set. The plan was to start in the Riviera and drive cross country, stopping in Provence and the Perigord on our way to Bordeaux in the west. We booked places to stay in Monaco, Avignon, Sarlat and Bordeaux, heavily relying on Trip Advisor reviews and our overall impression of each hotel's website. The next step was to fill in our blank canvas with color. This brings us to Dina's friend Laura. She suggested a honeymoon registry. It would help us with ideas, while involving our friends and relatives with the trip. We loved the concept, but now had to find the perfect website. Traveler's Joy had it all. It was easy to navigate, required no setup charge and had a comparatively low fee. Only indulgences were registered for, from breakfasts at our hotels to gastronomic dinners. We searched the web and found canoe rides past landmarks and a hot air balloon above castles. We thought we had it covered, but didn't realize how big of a hit it would be. The demand to add more gifts on our Traveler's Joy registry grew as we kept receiving everything listed on our registry. It forced us to seek more ways to make our trip better! We went through every website and book we could get our hands on to find festivals, concerts and terrific restaurants to register for. Then came the big event...the wedding at the Rockleigh Country Club was amazing! Exhausted the next day, we boarded Air France and were asleep before take off. After landing in Nice, we took a cab to the Vista Palace Hotel. It was perched high above Monte Carlo on the Grand Corniche, and as we requested, they gave us a sea view room overlooking Monaco. It was absolutely stunning! After some relaxation by the pool, we got washed up and ready for a glamorous evening out on the town. It was such a thrill gambling in the world renowned casino, and felt pretty good taking some of their money too! We found a charming nearby restaurant and celebrated our winnings with a three course meal and a bottle of Chateauneuf du Pape (more on the wine to follow). The next three days started with beautiful buffet breakfasts in the hotel overlooking the sea; one of many items we received on our honeymoon registry. 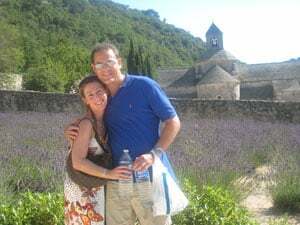 We spent the rest of the time soaking up the sun by the pool and taking in the local sites in Monaco, including its Aquarium (registry), and the charming medieval village of Eze. After three nights in Monaco, the relaxation leg of our honeymoon was over and the adventure began. We picked up our Mercedes B180 at the Europcar office in Monte Carlo, hooked up our Garmin GPS (with the European Maps SD card already installed) (registry) and off we went. We took the Autoroute to Aix-en-Provence where we walked around and had an amazing gastronomic lunch at L'Amphytrion (registry), recommended by Rachael Ray on her show Rachael's Vacation. Afterwards, we had time to burn prior to our next check in. So, we grabbed the GPS and typed in the lavender rich Sénanque Abbey. The freedom to go wherever we wanted, whenever we wanted, was one of our favorite features of the trip. We were so relieved to not be tied down by tour groups and train schedules. Later, at the Hotel D'Europe in Avignon, we were greeted with a room upgrade. It included a little terrace in the courtyard where we shared a bottle of wine from the vineyard we visited on the way. The hotel had a great location in the old city, and Avignon was the perfect base to explore the rest of Provence. The next day started with an eight kilometer canoe ride down the Gardon River (registry). It ended at the Pont du Gard, a massive aqueduct built by the Romans. It was the perfect place to rest and have a French picnic, put together using brie and prosciutto on a baguette, all purchased from a local supermarket...yum. Later, we went to the wine village of Chateauneuf du Pape where we tasted and bought some amazing wines. We thought the place so great, we came back the next day for their annual wine festival. The fair was so much fun. Most of the town residents were dressed in medieval costumes, and for the price of admission we were allowed to sample all the local wines and goods. Later that evening, we went to the town of Orange and its Roman amphitheatre to see the opera "Faust." Howie's parents purchased the tickets for us online as a shower present. It was such a special experience, seeing the opera under the stars in a 2,000 year old site. The next day we headed to Sarlat on our longest drive of the vacation (five hours). On the way, we stopped in Carcassonne for lunch. The whole city was breathtaking, with its Magic Kingdom-like castle and famous walls. We loved the place so much that it was a struggle to drag ourselves back to the car to complete our trip. Once we arrived in medieval Sarlat, we checked into La Lanterne Bed & Breakfast. We only needed to walk a block to find a row of restaurants serving the local specialty...duck. Although not well known to American tourists, the city is a true gem in the heart of France's Perigord. The next morning, we woke up before sunrise for the highlight of the trip, a hot air balloon ride above the castles and chateaux of the Dordogne River (registry). It felt as if we were floating on air. The pilot took us high above the clouds, and we took some of our greatest pictures. After landing, breakfast was served and we had the rest of the day to explore the Perigord. From a walnut oil mill, to a foie gras farm, to a cave featuring 15,000 year old Cro-Magnon paintings (registry), we saw it all. 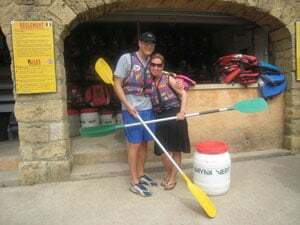 As for the next day, we cooled off in the Dordogne River, paddling a canoe (registry) past the same castles we saw from the air on our balloon. We even got a chance to stop in and see a few! The day finished in Sarlat, and a bag was purchased to bring home all the wine, foie gras, oils, lavender and crafts we bought on the way. The next morning put us back on the highway and headed for our final hotel. But before arriving, we spent the heart of the day in St. Emillion, the oldest wine producing village in France. Lunch was in a beautiful café overlooking the town. We then participated in a two hour wine tasting course (registry), learning how to evaluate wines based on their color, nose and palate. This was particularly useful at our next hotel, Les Sources de Caudalie, which is located on the same grounds as Chateau Smith Haut Lafitte winery. It is a member of the Small Luxury Hotels of the World, and a truly amazing place to stay! Dinner that night in the hotel's country inn was delicious, as was the buffet breakfast the next morning in its gastronomic restaurant (registry). Afterwards, we both went to the hotel's spa for a half day "Introduction to Vinotherapy" package (registry). It included four treatments each: a grape body wash, Merlot wrap, exhilarating massage and peachy facial. Plus, all the grape extracts used were directly from the hotel's vineyard! Afterwards, we received a complimentary tour and tasting at Chateau Smith Haut Lafitte. Our guide was wonderful, showing us every facet of the wine-making process. A tasting of both their red and white wines followed, and we bought several bottles to bring back home including a special vintage to keep for our one year anniversary. All in all, our honeymoon was a dream come true. The cost per person for the twelve night trip, including airfare, hotels, meals and activities was about $5,000 each. Yet, this was greatly reduced using Traveler's Joy. It was the best trip of our lives, and we truly feel that there was nothing we would've changed. 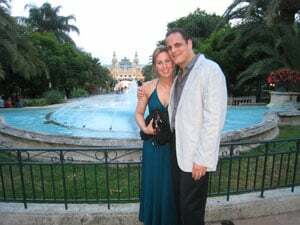 We would recommend this itinerary to any couple wanting a honeymoon in Europe, as everyday brought new surprises and ways to escape together in a beautiful, warm and exciting environment!